There's an awful lot of Japan-only content in this news update, so I'll start off with some cuteness to soften the blow. 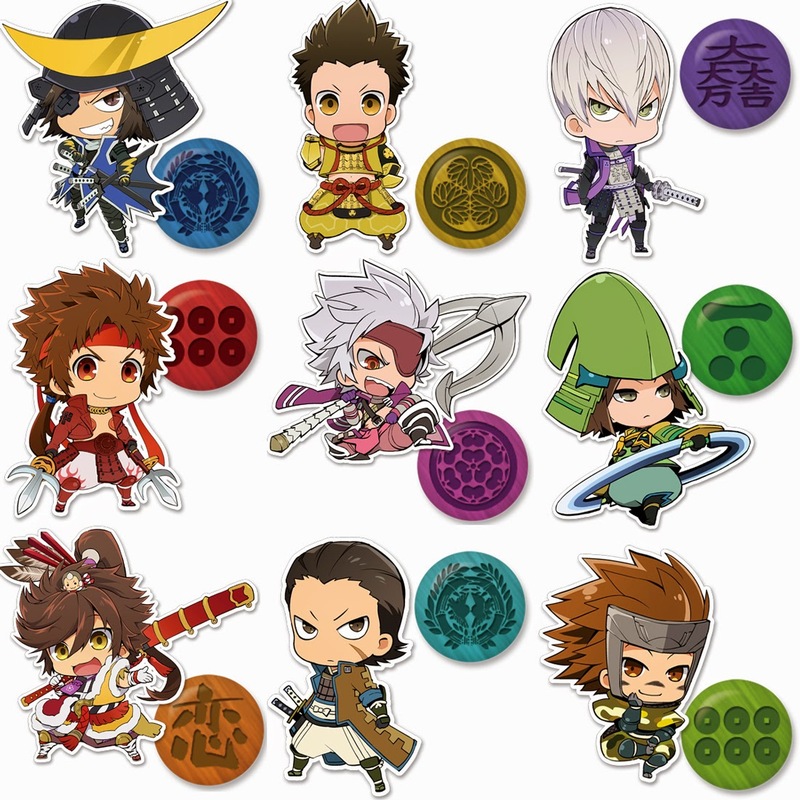 The Mame Sengoku Basara series continues to drive its fans into poverty by inspiring more and more adorable merchandise with every passing week. Here are the latest goodies, all of which are planned for December 2014. This will probably be confirmed in next week's issue of Dengeki Maoh but since Mangaoh already have it up for preorder and the timing's about right, I'm going to jump the gun and report it now. The second volume of Yoshihara Motoki's Sengoku Basara 4 manga adaptation is scheduled for release on 20th December 2014. It won't be long before fans who don't subscribe to Dengeki Maoh can catch up on all of the beautiful artwork that Yoshihara has been teasing on Twitter for the last few months! I mentioned that listings for a new novel titled Sengoku Basara 4: Saikyou-Chouhan-hen ('Western Misfortune/Cho-han Arc') had been spotted the other day, but the author Takase Mie has since posted on Twitter to explain that the novel won't make the leaked release date of 8th November. We'll have to wait for an official announcement to find out when it will be available. The general release of the Butai Sengoku Basara 3: Togakuruwashi Kizuna stage play DVD has been confirmed for 21st November 2014, with listings appearing on major online video stores over the last few days including Amazon Japan (LE) and CD Japan (LE). The specification matches the version which was offered through the Dais Shop for delivery in September (it was later delayed to 'late October' and has yet to ship). The 182-minute DVD comes in a choice of standard and limited edition formats. The limited edition version adds a photo booklet and a bonus disc with 94 minutes of extra content. This includes 'making of' footage, the curtain call messages from the finale and a compilation from the special talk shows held after a few of the performances. Given that the prices are quite similar, I think the limited edition is great value! Yukimura is certainly popular these days! He's the focus of another historically-themed celebration with the Tennouji Sanada Yukimura Fair on 1st November 2014, when a special event called Sanadamaru No Jin will be held as part of the ongoing Fair activities. 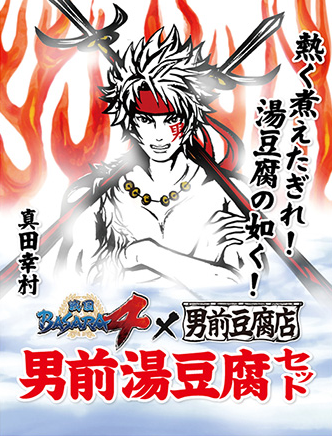 Visitors who travel to Sanadayama Park in the heart of Osaka can enjoy a selection of attractions, and amongst them will be a Sengoku Basara 4 booth run by Capcom. They're even bringing the new mascot character Yukimura-kun along! Crazy tofu brand Otokomae will be selling ¥300 packs of boiled tofu with an exclusive packaging design, exactly as they did back in May. It's an interesting choice of illustration - very fitting for the tofu brand's image. We were promised details of a way to earn a special Sengoku Basara 4 smartphone wallpaper by helping charity, and those details have finally surfaced this week. The Akai Hane Kyoudou Bokin ('Red Feather Community Chest') charity campaign has released a couple of Android applications to allow people to make donations and receive digital rewards. Unfortunately, I don't have any Android devices - and even if I did, I suspect that this app will be another victim of Google's hyper-aggressive region locking which seems to make any software I would ever want to use unavailable outside Japan. I hope they'll consider an iOS version before the campaign ends in March 2015. The Animate Girls Festival 2014 (AGF) convention will be taking place in Japan next month, and one of the scheduled events is an exclusive stage presentation to celebrate the release of Sengoku Basara Judge End on Blu-ray and DVD. The only way that a person can get tickets for the presentation is to buy a ticket for AGF itself (they were already almost completely sold out before it was announced) then, in addition, preorder the second volume of Judge End at a specific branch of Animate in central Tokyo. Fans who are willing to meet these rather unreasonable criteria will be rewarded with a live talk show starring seiyuu Ookawa Tooru (Tokugawa Ieyasu) and Hoshi Souichirou (Sanada Yukimura). The event had previously been advertised with Seki Tomokazu (Ishida Mitsunari) instead of Hoshi, but for some reason the guests were suddenly changed. I'm glad that they're still supporting Judge End even though it's been a bit of a flop. Getting to see any of the seiyuu live is a real treat, after all. 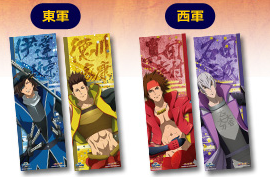 Fans who are planning to buy tickets for the Ichiban Kuji V: Sengoku Basara Judge End ~The Battle of Sekigahara~ mini-lottery can now take a look at the range of thirty postcard-sized 'charamides' which will be on offer as prizes. 'Charamides' (it's a coined word; more info here courtesy of eirlystylluan) are collectible pictures printed on photographic paper. Each winner will receive a randomly-packed envelope containing three of them. There are two additional charamides which can be earned by customers who buy five or more tickets at a time. Only people with Japanese mobile phones are allowed to participate in the next two parts of the event but I'll mention them anyway for the sake of completeness. All of the charamides come with a unique code on the back to let the holder vote in a special online contest for a chance to win additional prizes such as posters and sound clips. In addition, to raise awareness about the lottery, there's a Twitter campaign running right now. 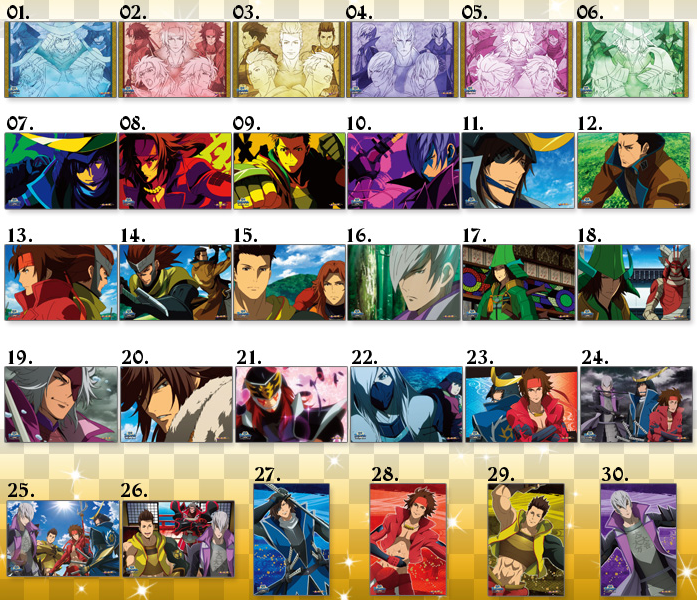 Six winners will be chosen to receive Sengoku Basara Judge End posters. Entrants have to follow the official Ichiban Kuji account on Twitter, then retweet the official announcements or talk about the upcoming lottery using the hashtag they list on the page.